GeoVision 5300 is a new model in Prestigio product line. The device has a 5” touch screen and a slim 12.5 mm body with aluminium frame. It is notable for stylish look, convenience for the user and perfect quality. The device contains preinstalled Mireo DON’T PANIC software developed by Mireo Company, Croatia. This application is already well-recognized in Europe, and now it enters the Ukrainian market. Mireo DON’T PANIC includes the detailed CarteBlanche map of Ukraine, providing accurate route calculation between cities as well as inside settlements. The map features detailed coverage of in-block passages in Kyiv and many other cities and includes about 75 800 POIs. Owing to the combination of perfect software, an accurate map and a quality device, Prestigio GeoVision 5300 makes driving easy and stress-free. All navigation functions such as route calculation, map rendering and search for places work instantly, while the convenient interface of Mireo DON’T PANIC provides access to any function in one or two taps. The software supports search for house numbers with fractions and letters and calculates the route directly to the chosen building. 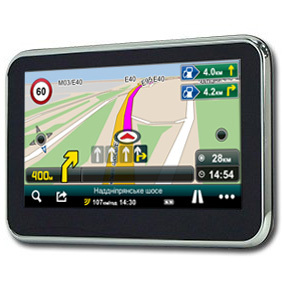 Now the Ukrainian users have a fully localized GPS navigation solution, not only with menu and voice guidance in Ukrainian, but also taking into account all local addressing system peculiarities such as house numbers with fractions and letters and complicated in-block passages in residential districts. At the same time the application can boast first-class quality and amazing speed. For 1 year free updates for the map of Ukraine are available. 3D Landmarks: 57, including NSC Olimpiyskiy (Kyiv), Donbass Arena (Donets’k), Arena Lviv and Metalist (Kharkiv) stadiums, where EURO-2012 matches were held. Map updates are released up to 4 times a year! To update Mireo DON'T PANIC for Windows CE with the map of Ukraine, follow the link below to download an installer to your PC, then run it and follow the instructions.